Easily one of the most popular characters to originate in Star Wars animation is Clone Captain CT-7567, a.k.a "Rex". He first appeared in Star Wars: The Clone Wars, later made his way into Star Wars Rebels, and even became the subject of a massive fan theory that would have put him in Return Of The Jedi. Even as Rebels draws to a close, Rex's impact on Star Wars and its fandom continues to be felt. 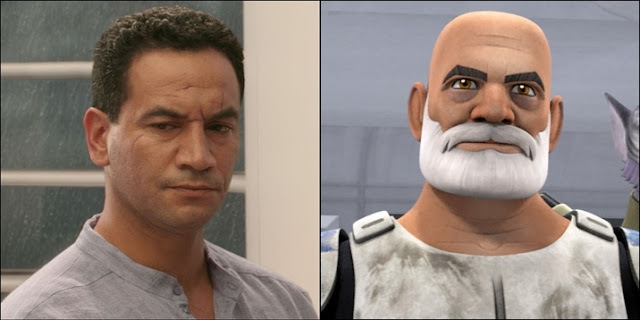 One person who is looking forward to seeing more of Captain Rex is none other than Temuera Morrison. Morrison is best know for portraying the original Clone template, Jango Fett, in Attack Of The Clones, and a number of Clone Troopers in Revenge Of The Sith. In the years since Morrison has voiced Jango, Boba, and Clone Troopers in various mediums, but now it seems he's return to the big screen. StarWars.com: "It must be pretty cool to think, 'I played Boba Fett's dad'. Plus your voice gets to live on as Boba Fett, and your face was used for all of the clones!" Temuera Morrison: "They're all in my Jango Fett line – I have clones lining up. Then, of course, there's Captain Rex, who's an iconic character. I've also voiced various games. What'll make me really happy is if I get the phone call asking me to play another character – an older Captain Rex or something. I want to pop in on one of these new ones, that would be great. Suggest it to them for me! Let's get on to it!" It's exciting to know he's eager to return as any version of Jango, especially Rex. If and when Captain Rex gets his time to shine in the feature films, it would be an extra treat for fans to have Tem Morrison back in the role. Lucasfilm, are you listening? I think they should do an Ahsoka movie which would include Rex as they are a team. I also think if they do a Boba Fett Movie it should include him. Continuity would be nice for a chance. He certainly could but he would need a big white beard like rex. I think he should play Rex. That would be neat. If they bring Ahsoka into live action, he needs to be there.